If you've never enjoyed a wordless picture book before, Princesse Camcam's gorgeous book for children is a wonderful place to start. The cut-paper illustrations in this French artist's story are stunning and beautiful. 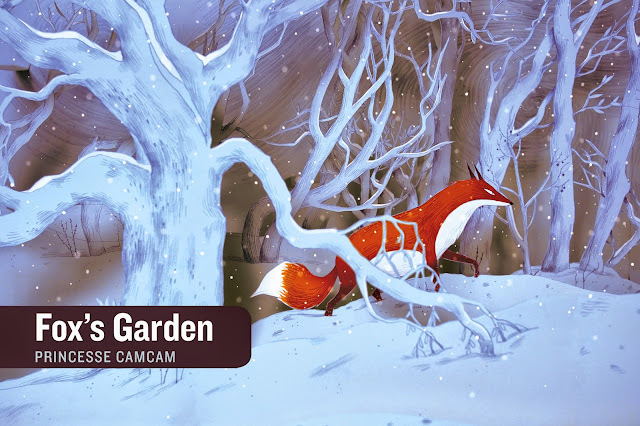 Fox's Garden is the story of an expectant fox looking for a warm place to give birth to her babies in the middle of winter. She is chased from the village and wanders about the cold forest trying to find shelter until finally she is able to rest in a greenhouse. When a young boy sees the fox resting in his family's greenhouse, he shows her kindness by bringing her a basket of food to help her in her time of need. Both he and readers are rewarded with the story's lovely outcome and moral.